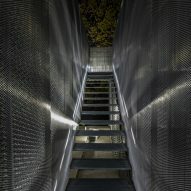 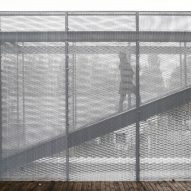 Layers of metal mesh are used to regulate the level of privacy and daylight for glazed creative studios added to a residential building in Beijing by local architecture firm Remix Studio. 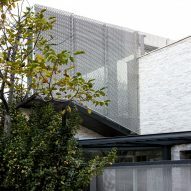 The WanWanShu project involved renovating two existing buildings and adding an extension that connects them in a single volume, to creates private residences topped with studio spaces for local artists. 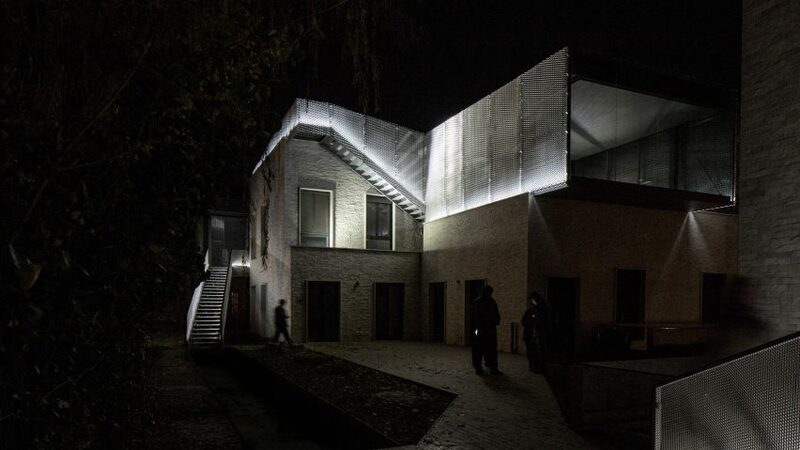 The new rooftop spaces offer varying internal light conditions for creative disciplines including sculpture, painting and pottery. 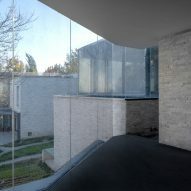 The choice of material on different sections of the building was determined by the interior requirements. 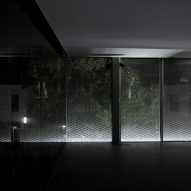 Maximising views was most important in the living spaces, while the quality of light was a key consideration for the studios. 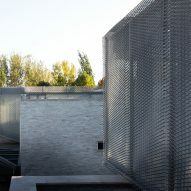 A minimal material palette was used throughout the project, with the extensions above ground all featuring glazed surfaces wrapped in a skin of expanded metal mesh. 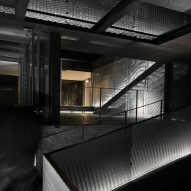 New underground spaces including a meditation room are constructed from exposed concrete. 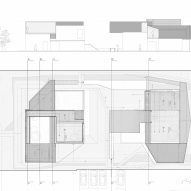 "The volumes weave around in their bare materiality, enveloping more private and secluded spaces, interiors that are of three types: meditation, rest and discussion," said Remix Studio in a project statement. 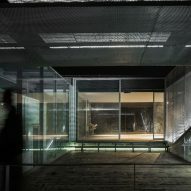 The extension's interiors are designed as a sequence of continuously connected spaces enveloped by the glass surfaces. 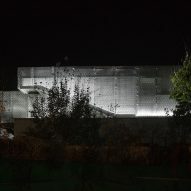 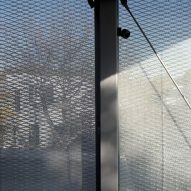 Mesh sheets are placed in layers around the outside of the glass, with the changing orientation of the sheets providing the differences in opacity. 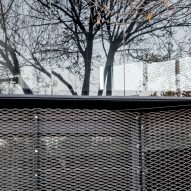 Remix Studio was also responsible for the landscaping that surrounds the building, which was designed to enhance the connection between the two blocks. 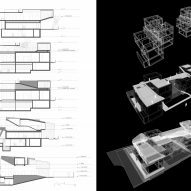 Pathways meander between and around the buildings to form part of the sequence of spaces that culminates in a bridge connecting roof terraces on top of both structures. 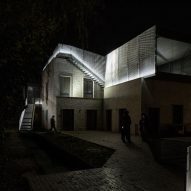 At ground level, the paved paths cut through gardens that will gradually extend onto the buildings as climbing plants on the elevated terraces begin to populate the facades. 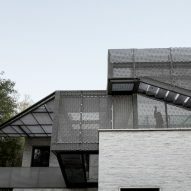 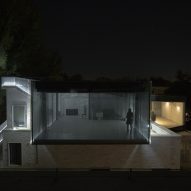 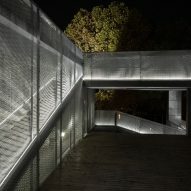 Remix Studio's previous projects include an extension to a house in Beijing with a minimal interior sheltered behind narrow steel louvres, and the transformation of a traditional hutong property into its own office, which features a metal mezzanine accommodated beneath the original wooden roof structure. 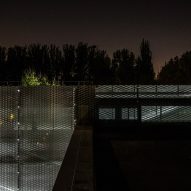 Photography is by Federico Ruberto.